China is likely to maintain cooperation with Iran even after the resumption of the American sanctions regime, scholars told Sputnik, adding that Beijing could play the role of a broker by creating a common platform for talks on the future of the Iran nuclear deal following Washington's decision to exit the agreement. 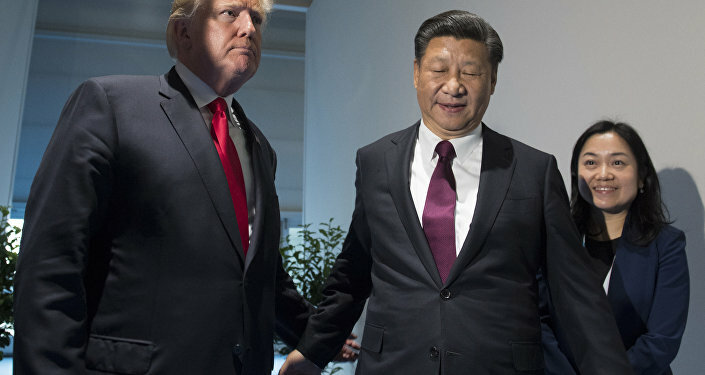 Beijing has a very good experience of using workarounds while developing cooperation with countries subjected to American sanctions, Irina Fyodorova, a senior researcher at the Institute of Oriental Studies of the Russian Academy of Sciences (RAS), told Sputnik China, commenting on Donald Trump's May 8 pullout of the Iran nuclear deal and his decision to resume anti-Tehran restrictions. "Could Chinese companies be slapped by American sanctions? Yes, of course, they could, but these sanctions would only mean that these specific companies will not be able to conduct business in the United States. So China, using its experience, will create companies that will operate only in Iran and cooperate solely with Iran. As a result, US sanctions would not significantly affect the activities of specific Chinese companies. China, as always, could use the window of opportunity, further increasing its collaboration with Iran," Fyodorova presumed. On the other hand, however, this would mean that Iran could come under China's influence in terms of investments and technological cooperation, she remarked, adding that in any event there aren't too many alternatives for Iran under the current circumstances. Following Trump's withdrawal from the Iran agreement, also known as the Joint Comprehensive Plan of Action (JCPOA), China's Foreign Ministry signaled that it will remain committed to the accords expressing regrets over the decision made by Washington. Addressing a press conference on May 9, Foreign Ministry spokesman Geng Shuang highlighted that the JCPOA is "a multilateral agreement" endorsed by UN Security Council Resolution 2231. "All relevant parties should implement the JCPOA in good faith and ensure its integrity and sanctity," Geng emphasized. He further noted that Beijing "will continue with normal and transparent practical cooperation with Iran on the basis of not violating our international obligations," elaborating that the Chinese government is "opposed to the imposition of unilateral sanctions and the so-called long-arm jurisdiction by any country in accordance with its domestic laws." Additionally, Beijing called upon all parties involved to come back as soon as possible "to the right track of continuing" the implementation of the JCPOA, pledging to maintain dialogue and consultation with all relevant sides. Referring to the Foreign Ministry statement, Ji Kaiyun, a researcher at the Center for Iranian Studies at the Chinese Southwest University, emphasized that Beijing needs to persuade all parties concerned, especially Iran, Israel and Saudi Arabia, to remain emotionless and not to make hasty decisions. According to the scholar, China should also initiate dialogue with EU member states on the issue. "Beijing could establish a platform for negotiations either in China or at another global level, invite the sides concerned to hold talks, or actively assist the relevant parties in searching for appropriate mechanisms. All this could be done to launch negotiations using [China's] international contacts. Undoubtedly, in any event, peace talks are the simplest and the most effective way [to solve the issue]. Reaching mutual compromise and broad common consent is the best choice for the international community," Ji believes. The Chinese scholar underscored that Beijing needs to proceed with comprehensive cooperation with Tehran regardless of Washington's withdrawal from the deal and boost trade and economic ties with Iran. On the other hand, the aggravation of tensions between Iran and America's allies Saudi Arabia and Israel may prompt Washington to promote a sort of "surgical operation" as a way to solve the problem, Ji suggested in a clear reference to the use of force on the part of the US. For its part, China should have options for all possible scenarios and be ready to respond to them, he added. As the UK, France and Germany have issued a joint statement condemning Trump's pullout and signaling their readiness to further implement the Iran agreement, observers suggested that both China and EU member states may develop mechanisms to evade Washington's sanctions. "China could help the EU to circumvent the US sanctions by offering alternative financial networks for conducting business with Iran," Tytti Erasto, a researcher on nuclear disarmament and non-proliferation issues at the Stockholm International Peace Research Institute, told South China Morning Post. However, Fyodorova does not share this stance: According to the academic, Beijing is not interested in finding ways for European companies to circumvent Washington's restrictions. "Naturally, China will somehow cooperate with European countries, but it will always seek benefits," she presumed. "China will not be engaged in any simple gratuitous assistance. On the contrary, it will continue to use the window of opportunity to boost the influence of its investments and technologies in Iran," Fyodorova opined.